- What do you charge to clean a fish tank? - I have a 10 gallon tank; is that too small of a job for your company? - How long will it take to clean my tank? - Does your cleaning service include any products? - Do you sell fish & equipment? - I assume you clean fish tanks, but do you set them up as well? - How often should I have my freshwater tank cleaned? - How often should I have my saltwater tank cleaned? - Do you offer regular maintenance programs? - I've always wanted a saltwater aquarium – can your service provide that for me? - I'm excited! How can I get started on one of your maintenance programs so I can just enjoy the tank and leave the hassles of cleaning it to your professional service team?? Q: What do you charge to clean a fish tank? Our standard service charge for a 1st time cleaning is $69.95 and covers the 1st hour of time. Any additional time is billed at $65/hour. Once we have cleaned your tank for the 1st time, if you wish to continue on with monthly service, we can provide you with a fixed price service plan quote. Q: I have a 10 gallon tank; is that too small of a job for your company? No job is too small! We service over 200 tanks each month ranging in size from 2.5 gallons all the way up to 400 gallons. Q: How long will it take to clean my tank? The length of time for a first time service will depend on the size and exact condition of your tank. As a really rough ball park figure, tanks up to 55 gallons normally can take between an hour and 2 hours. Q: Does your cleaning service include any products? No products are included in the price of the service call. We assume new clients will have the required chemical additives and filter media on hand, however, we do carry a wide selection of products should you need something during that cleaning. Q: Do you sell fish & equipment? Yes; although we don't have a retail store, we do stock a large variety of products and livestock. We can provide you with quotes on any equipment or product you are looking to purchase. When you purchase products or livestock from us, we deliver them during your normally scheduled maintenance appointment at no extra charge – that's free delivery for something you would have had to go out to purchase. Q: I assume you clean fish tanks, but do you set them up as well? Yes we do. Whether you have an old tank in storage, just purchased a new tank from the pet store or want to purchase the entire system from us, you can schedule an appointment with us to have one of our techs come out to set the whole system up and get it running for you. With the right additives, we can even add some new fish on the very first visit! Oops, you didn't know you needed a certain piece of equipment so you didn't buy one – don't worry, we probably have what you need and can bring it with us when we come out to setup your new tank! Q: How often should I have my freshwater tank cleaned? 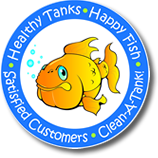 For freshwater tanks, we recommend having your tank cleaned at least once per month. Remember, even though the tank may look nice to you and I, waste levels are building up in the tank and can present real danger to your fish if they get too high. Regular water changes are vital to keep the waste levels in the tank at safe levels to keep your fish happy & healthy! In some cases, having your freshwater tank cleaned more frequently may be critical, especially in cases where you have very delicate livestock species or in situations where your tank is over-stocked or under filtered. Keep in mind that even though you have your tank cleaned monthly, it is still important to properly control the feeding of your fish as well as your tanks' lighting to keep your tank looking great all month long! Don't worry, we can help you make sure you are feeding your fish properly and limiting the amount of light your tank gets to optimize its appearance. Q: How often should I have my saltwater tank cleaned? Saltwater tanks have much more demanding maintenance requirements then your standard freshwater aquarium and a lot depends on whether you have a fish-only tank or a more complex reef system. In general, we recommend that you have your marine aquarium system cleaned a minimum of twice per month. We offer single monthly visit plans, semi-monthly visit plans and plans that include 4 visits per month. We only recommend single visit plans for clients who are interested in being hands-on with their aquarium so they can do water changes between our monthly visits. More complicated systems, especially those with extremely delicate livestock, may need to upgrade to have four visits per month. Q: Do you offer regular maintenance programs? YES! We offer monthly service plans for clients that want to continue with regular service. Our standard plans for both freshwater & saltwater systems include water conditioners, a bacterial additive, a fish-safe algae control product and pre-measured fish food. Pricing for your system will depend on the size of your aquarium, whether your system is freshwater or saltwater, type of livestock in your tank as well as what kind of filters you are running. Once we have all the details on your system, we can also tailor a program specifically for your system which can include the filter media required for your tank. Don't know all the details of your aquarium system? Don't worry! Contact us today to schedule a free assessment visit so we can see exactly what you have and provide you with a comprehensive proposal and quote for service. Q: I've always wanted a Saltwater aquarium – can your service provide that for me? Q: I'm excited! How can I get started on one of your maintenance programs so I can just enjoy the tank and leave the hassles of cleaning it to your professional service team? Don't hesitate to Contact Us and we can respond to your questions or you simply give us a call directly at 484-933-4054 with any questions you may have.